The Diamond Creek Traders association have teamed with local artists to showcase their works at local businesses in 2017. 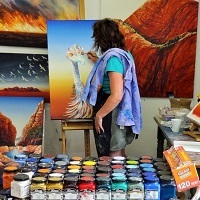 Linda will have her works on display at Degani, 29 Chute St, Diamond Creek. Drop in during trading hours for a coffee and see her quirky artworks. While your in the area pick up a brochure and see some of the other great local artists who are displayed by retailers throughout the village.